Reader Margel Walker Soderberg wants to know more about the father and grandfather who both practiced law in Kansas. They absolutely do generate records for themselves, Margel, and though you may need to jump through a few hoops to get them, you should be able to access quite a bit of information about their legal careers. In the nineteenth century, all that was required of someone desiring admittance to the bar was to “read the law” under the direction of a practicing lawyer for a period of a few months, then take a brief and unchallenging oral examination in front of a panel of admitted lawyers. Since Kansas’ earliest days of statehood, all that was required for bar admittance, was that the candidate had to have “requisite learning and good moral character.” Such lax requirements allowed for many under qualified candidates to gain bar admittance. Ultimately, lawyers who later became judges were so uninformed about the law that decisions from different judges resulted in a common-law legal code that was terribly inconsistent and uncoordinated. By 1897, the (Kansas Bar Association) began advocating … that candidates should be required to study law for at least three years in either a law office, or the Law Department of Kansas University. It further recommended that bar exams be held biennially, under the direction of the Supreme Court, and be held publicly in the Supreme Court Chambers. These recommendations became law in 1903, with modifications. And here, you’re very fortunate since both the archival records of the Kansas Board of Law Examiners — the board set up to test those who wanted to practice law in the Sunflower State — and the records of the Kansas Bar Association are held by the Kansas State Archives unit of the Kansas State Historical Society in Topeka. Between those two — the early records of the Law Examiners and the later records of the Bar Association — anyone looking for information on Kansas lawyers of the 20th century has a pretty good shot at finding gold. They’re not online, so you’ll need to make a research request of the Historical Society staff, hire a local researcher or make a road trip. Now your grandfather poses an additional challenge but may have additional rewards because because he spent part of his legal career working for the federal government. Records of civilian employees of the federal government fall into two categories: archival (those whose government service ended before 1952) and non-archival (for those whose government service ended in 1952 or thereafter). For archival records, the National Archives at St. Louis holds the Official Personnel Folders (OPF) — “primarily administrative records used by the government to make accurate employment decisions throughout a Federal employee’s career”4 — that can be requested by mail, or in person, or through a researcher hired to do the work at the archives. Directions on ordering the files are on the Archives.gov website. For non-archival records, a request has to be made under the federal Freedom of Information Act, and only certain information can be released — more if the person is deceased, less if the person is still living unless the person authorizes the disclosures. Information about how to make the request and what to include is also on the Archives.gov website. Good luck in finding out more about your lawyer forebears, Margel! Let us know what you discover. I have been tracking attempting to track down a lawyer in my research, who also practiced in several locations, NY (NYC), Baltimore and District of Columbia, 1850-1925. Would I use the same methodology in the case of Kansas to find records in my research? I had thought of actual court cases since he practiced in immigration law, corporations and probably claims from Civil War losses. Appreciate your feedback. Actual court cases (make sure you do a name search on Google Books, HathiTrust and Internet Archive), newspapers, court records, boards of bar examiners — the whole shooting match. Any of them could provide the lead you want. What a delightful post, Judy! This one is a double score for me. One of my great grandfathers would have been involved in the Kansas proceedings you refer to as he was admitted to the Kansas Bar on 1 March 1898 having read law for two years. He later became Kansas Attorney General and eventually Chief Justice of the Supreme Court of Kansas. I have looked at his personal files at the Kansas Archives. 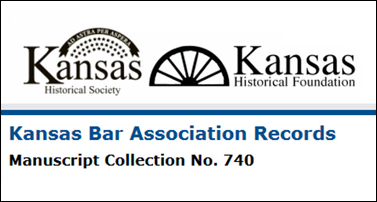 Next time I’m in Topeka, I’ll have to check out the Kansas Bar Association Records collection! The facility and staff there are top-notch. The federal employee information is of interest as well. I had a mysterious aunt who worked as a secretary for the War Department then the OSS and CIA. Perhaps a FOIA request might shed some light on her assignments and foreign postings. Good luck in finding records of your mysterious aunt, Skip — and let us know what you find!! Thank you so very much! My grandfather, Carroll Walker, did not get a law degree but graduated from Kansas State Agricultural College with a degree in electrical engineering and after his graduation in 1908 he worked at a variety of jobs while he studied for the bar exam with various Marshall County lawyers. He was city attorney in Frankfort, Kansas during the 20’s. I am so excited to know that I now have a research path to follow. In a city directory from the 40s, he was described as Chief counsel for the Internal Revenue in St. Louis. He was always involved in politics, and I am sure that was the reason he got the Internal Revenue job. I would encourage others to look for cases – Using a Google search, I found one that went all the way to the Kansas Supreme Court. Very interesting, although difficult, reading. My father did graduate from Columbus School of Law in 1941 so requirements had changed by this time. Your grandfather is all over the court case books, Margel — he wrote the brief for the Government in a case before the United States Court of Appeals for the 10th Circuit — McCoy v. Commissioner, 192 F.2d 486 (10th Cir. 1951), represented the government throughout the 1940s in the U.S. Tax Court and was attorney of record for a number of Kansas Supreme Court cases. Good for you — you’ve got a lot to work with here! Now to find those cases. I had only found one with a Google search. It was a Kansas farmer named McCoy – my grandmother’s maiden name so possibly a relative. Most possibilities seem to be located on pay sites. I am so enthusiastic about this — I can’t thank you enough. After I posted my reply, I went and looked at my grandfather’s obituaries again. One of them gave more information about his law career, such as the date he passed the bar and where. This should be helpful in finding records. One thing puzzled me though. It stated that he was “admitted” to the Supreme Court of the United States as well as several other courts to which he was “admitted”. What does that mean or did the person writing the obituary just get carried away? Nope, this isn’t hyperbole at all. Each court, including the Supreme Court of the United States, controls its own admissions of attorneys and your grandfather very likely was admitted to several courts. Your grandfather’s name should be on the roll of attorneys of the Supreme Court, in Record Group 267 in the National Archives, in the series for Records of the Office of the Clerk, 1790-1961. Very cool! You’re going to have a ball tracking this stuff down! And as for your father, don’t forget to contact the alumni office at the law school. They’re often very helpful too.